Disclaimer: I received a complimentary copy of this book from Workman Publishing Company via Netgalley in exchange for an honest review. Any parent or educator of young children will be aware of, and maybe a little frazzled by their insatiable curiosity about the world and constant questions on every subject under the sun. How Come is a useful reference book for answering queries like “why is the sky blue?”, “how was the earth formed?” and “how does arm hair know to stop growing?” It is compiled from the questions sent by children all over the world to the newspaper column How Come? published in Newsday. The book is divided into sections covering different general subjects such as the human body, the animal and plant world and “the great beyond” (space). The explanations of various phenomena are fairly simple, and could be understood by a child about seven or so (depending on the individual) and adults may learn a thing or two as well. The book is livened up by cartoon illustrations by Debra Solomon. 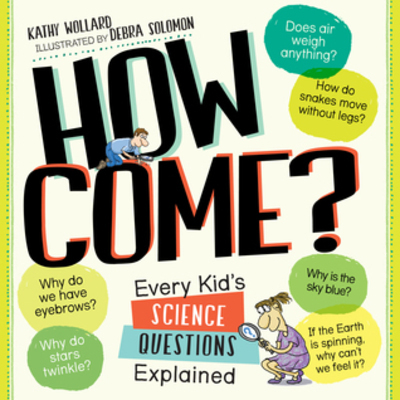 This book would make a great gift for a science mad child like my daughter, or for a parent or teacher who is struggling to keep up with their child's questions.